DOMAIN EUKARYA: In this group all animals have a nucleus and can be multicellular or single celled. KINGDOM ANIMALIA: Most animals are made up of cells, swallow food and digest it and are heterotrophs,which means they rely on other animals for food. PHYLUM CHORDATA: All of these animals have bilateral symmetry, have a segmented body & muscles and have a tail at some stage of their lives. SUBPHYLUM VERTEBRATA: These animals share a vertebral column, other known as a spine, running from head to tail that form the main skeleton of its body, have a digestive system and they all have red and white blood cells. CLASS MAMMALIA: They have hair at some point in there lives, have teeth that fall out only once during its life and have a lower jaw made up of a single bone. ORDER CARNIVORA: Members have have a fourth upper premolar and first lower molar for cutting meat, have blubber and have different sized skulls. FAMILY FELIDAE: The cat family has a short tooth row, which increases bite force, Have retractible claws and have well developed teeth. GENUS PANTHERA: This genus only includes the Leopard. HEIGHT: Usually, Leopards are 45 to 78 cm. WEIGHT: On average, Leopards weigh 17 to 65 kg. COLOR: Most common coat colors are tawny, light yellow in warm habitats and reddish-orange in dense forests. They are covered in black rosettes and have solid black spots on their chest, feet, and face and rings on their tail. Cubs are smoky gray and rosettes are not very visible yet. NATURAL RANGE: Leopards are commonly found in Africa, Arabia, Central Asia, Java, Sri Lanka, Indian sub-continent, southeast Asia into southern China, northern China, far east Russia, on the Korean peninsula and in north-eastern China. DIET: Small mammals, musk deer, sika deer, roe deer, wild boar, elk, birds invertebrates, domestic livestock. Also fish and carrion. HABITAT DESCRIPTION: Leopards are mostly found in mesic woodlands, grassland savannas, forests, mountainous, scrub, desert habitats. PREDATORS: Cubs are most at risk from predators, such as lions, tigers, spotted hyenas and African wild dogs. These are some examples of a leopards diet. 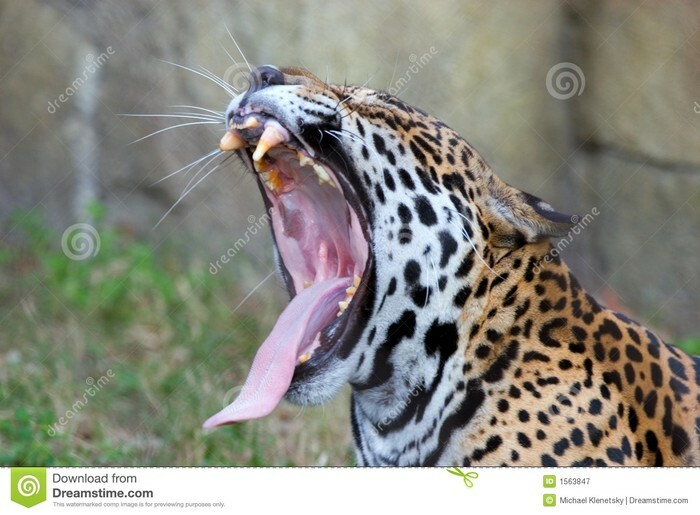 Leopards have strong teeth that they use for catching and eating meat. 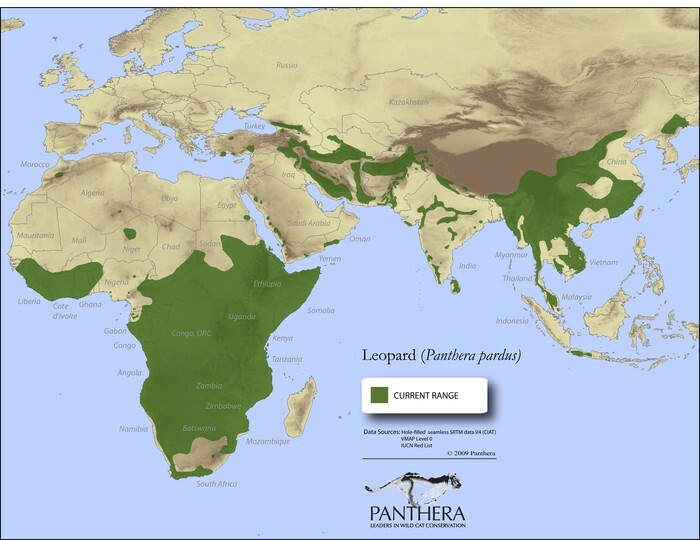 This is where Leopards are normally found around the world. Leopards massive skull allows them to have powerful jaw muscles to help them catch, rip, and chew there prey. Also their scapula has attachment sites for climbing muscles to help them climb trees to store there food in and to help get away from predators. Leopards have long whiskers on their eyebrows to protect their eyes when hunting or fighting other Leopards by keeping the sand and dirt out of there eyes. Their coat colors range from light yellow to reddish-orange to help them blend in to there surroundings to stalk pray and hide from predators. To also help with blending, they have spots, called rosettes, all around to help them blend even more. Leopards are nocturnal around humans to keep safe and to not be seen. They also mark their territory to keep other leopards from hurting their family. They do this by urinating on a piece of landscape, then protecting that piece from other male leopards. 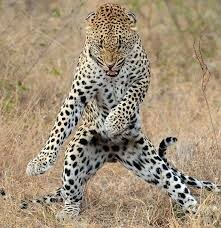 Leopards can also jump up to 6 meters to catch prey. They have advanced vision and hearing to watch for danger and food. They store their food in trees to keep it away from other animals. Leopards are mostly silent, but they do make a hoarse, rasping cough to indicate territorial boundaries. This is mostly used by males. Leopards also may purr when they eat. Burton, M., & Burton, R. (2002). Leopard. In International wildlife encyclopedia (3rd ed., Vol. 11, pp. 1444-1446). New York, NY: Marshall Cavendish.